Just wondering if anyone has been successful in displaying the Singapore airport map for Imaginesim's WSSS. No matter what I try, it still shows as the default scenery layout in the Display Unit. Any help greatly appreciated. 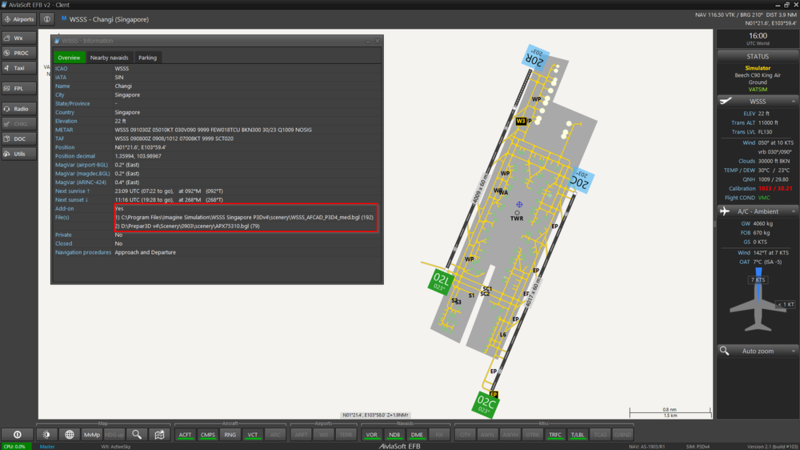 When WSSS is the active airport and you press the "i" (Information) button on top left of the EFB Client, you will see the origin of this airport. Could you provide a screenshot from this dialog? Could you also provide a support-file from the Server? Maybe there is a trace about the cause in the logfile. Thanks! Hi Urs, thanks for the quick response. The issue, l believe, is with the way Imaginesim (IS) installs to P3D. Their scenery files and xml addon are completely independent of how other 3rd party addons work with P3D. For example, the IS WSSS does not add to the scenery.cfg nor does the xml add to the P3Dv4 Add-ons folder. I will contact Imaginesim for a solution (hopefully!). thanks a lot for this information. The database builder only searches in the official paths, so it would be a good idea if ImagineSim would place their add-on.xml files therein. As long as the installer writes its own package into the add-on.cfg, the position of the add-on.xml is not important as it will be found within the package path (also by EFB v2).